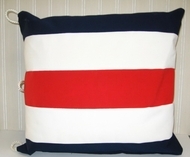 18x18 or 22x22 cotton Nautical Pillow letter C or "Charlie". Need a larger size, just give us a call. Sunbrella indoor/outdoor pillows also available in this design. Use drop down menu to select your size. Mildew and Fade resistant perfect for outdoor patios, boats ect.